A Raith Rovers supporter was lucky to avoid injury after smoke flares were discharged at the Scottish Cup match against Dunfermline Athletic on Saturday. The fan's shoes were melted by the heat expelled from one of the pyrotechnic devices, which were set off in the South Stand before being thrown onto the pitch, causing damage to the artificial surface. Raith safety officer, Bob Farmer, revealed: "A spectator came into contact with one of the smoke grenades and it melted his training shoe. "He was very fortunate he wasn't injured." Mr Farmer has been working with police to identify the culprits, all believed to be teenagers, with one arrest made and further enquiries ongoing. "Police have been very helpful and keeping us up to date with their enquiries," he said. "They are hopeful of catching everyone responsible." 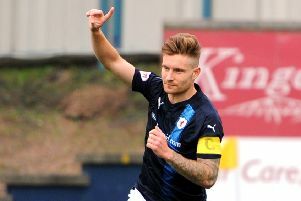 As well as the cost to repair the damage to the pitch, Mr Farmer revealed Raith could face further financial hits in terms of SFA punishment as well as extra stewarding. "The difficulty when responding to these types of incidents is that we've got to review our entire processes," he said. "This means spectators will now be inconvenienced at the turnstiles because we will be conducting more searches, and more searches means more stewards. "We're also still waiting to hear from the SFA because undoubtedly this matter will be referred to the compliance officer and we'll have to respond to that. "My concern is purely for the safety of spectators at the ground. "We've had a supporter's shoe melted, but we also have a number of young children in what is a family stand, as well as a fair degree of over 65s. "We also don't know if any supporters may suffer from breathing difficulties such as asthma, which could be triggered by inhaling the smoke. "We can see from various social media sites that a mainly younger element of supporters see this as adding to the atmosphere but no thought has been given to the impact." Mr Farmer added that the club will be seeking compensation for the damage to the pitch. "It's something that is going to be looked at," he added. "If there are criminal convictions then the court could decide on a compensation order but there are other routes to go down with regards recovering costs."